Fashion Herald: Punk Rope, Market Shopping, Origami, Yoga, Meditation, and More: Now at One Penn Plaza! Punk Rope, Market Shopping, Origami, Yoga, Meditation, and More: Now at One Penn Plaza! A version of this post first appeared yesterday on the Bryant Park blog. Bryant Park is the 34th Street Partnership's* sister company. Blog readers who live and work near Penn Station may be pleased to know that we've teamed up with Vornado Realty Trust, a property owner in our 34th Street Partnership district, to enliven the plazas surrounding One Penn Plaza. The three plazas, located between 7th and 8th Avenues and 33rd and 34th Streets, surround one of the largest office buildings in the area. Strengthen your body with twice-weekly Vinyasa-style yoga classes with Studio Anya on Tuesdays and Thursdays, at 7:30am. Some mats are provided, but bringing your own is encouraged. 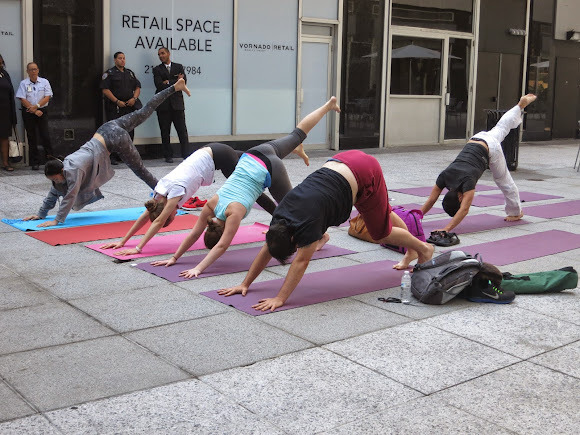 Downward dogs take over Park East at One Penn Plaza. Gain mental stability with meditation classes in partnership with Ziva Meditation, every Thursday at 3pm. For those who want a more intense workout:. Boot Camp with Warrior Fitness Boot Camp, which meets Fridays at 7am, is a calisthenics-style workout led by two former Marines. Join the Bryant Park jugglers every day from 2 to 4pm and learn to juggle or just enjoy the show. Each Tuesday from 3 to 4pm, learn the ancient and calming art of origami. De-stress as you impose order on the crisp folds of paper before you. Brightly colored origami paper brings people together every Tuesday at 3pm. Every Wednesday, the Penn Plaza French Market brings a variety of fresh produce, prepared foods for a scrumptious lunch, and handmade crafts and jewelry that are perfect for a quick browse on the way back to the office. Fans of the Broadway French Market will notice the markets are similar; they are both produced by Bensidoun USA. Enjoy nature's bounty every Wednesday at the One Penn Plaza French Market. Unwind after a busy work day with jubilant brass band performances. The performances are three times weekly, starting at 5:30; check our website for the week's performers and dates. 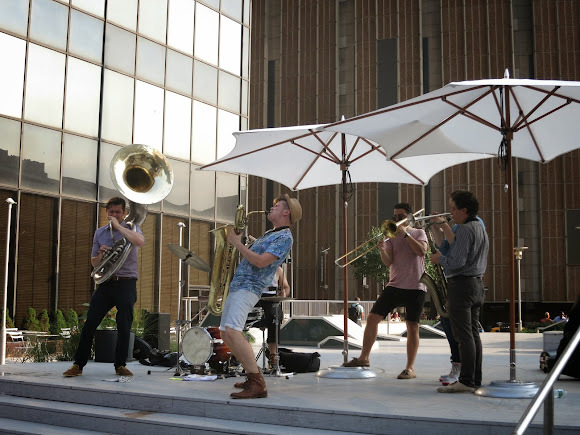 Joyous brass brightens up the end of the workday. Stay tuned as we add other events, programs, and classes to the lineup. *The 34th Street Partnership owns and operates Fashion Herald.